Discover a unique celebration on Pay of the Dead Slot at Moon Games! This Gaming Realms creation is based on a Mexican celebration called Day of the Dead, during which special altars are created to remember close and dear ones who have passed away. The game consists of 5 reels and 20 paylines. It may remind you of the animated movie, Coco! Pay of the Dead Slot is set against a background showing the wall of a whitewashed building, with the reels framed with 2 candles on both sides. On top of the reels, you can see roses and a special flower called Cempasuchil, a Mexican marigold. The scent of these marigold flowers is said to make the souls feel welcomed and happy. While you spin the reels, you can see symbols like Decorated Skulls in green, purple, orange, blue and yellow, as well as A, K, Q and J. Play Pay of the Dead Slot by selecting your stake value using the “Stake” button. Once it is done, press the Spin button to begin. Your goal is to create winning combinations of 3 or more identical symbols on the reels. If you wish to relax during your gameplay, make use of Auto Play to enjoy several rounds played without any intervention. Amount of Paylines Selection: The 20 lines are fixed and cannot be altered. Coin Values: The bet values range from 0.20 to 50.00. The Chihuahua head on Pay of the Dead Slot stands for Wild and replaces any symbols, except Scatters. For 5 of its kind, it awards up to 10,000 units. It can also apply a multiplier of 2x, 3x or 10x to your win. A special Wild is available, which picks a random multiplier applied to all special wild line wins. Scatter is represented by the Red, Blue and Mixed Candles. These help to trigger the Free Spins Feature. Blue Candles: Earn unlimited free spins, 3 lives and a maximum multiplier of 5x. During this feature, if one of the spooky characters with a white face shows up, you lose one life. However, each lost life increases the multiplier to 2x, 3x, 5x or 10x for any remaining wins depending on the triggering Candles. When 2 Bonus Candles land on the reels, you are given the chance to buy a re-spin on reel 3 to try and land the final scatter. The cost depends on the current stake amount. 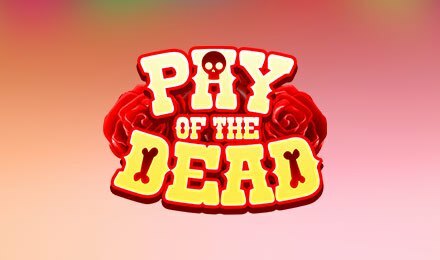 Without wasting a minute, play Pay of the Dead Slot at Moon Games, where you can enjoy a panoply of highly entertaining games. Good luck!